"Toshi Ranbo is on the minds of many." –Lisa Farrell, "The Specters of War"
For more than one-thousand years, the Great Clans of Rokugan have served the Chrysanthemum Throne, but recent tensions between the clans threaten to tear apart the Emerald Empire. The Crane and Lion teeter on the brink of war, even as broken promises have led to animosity between the Lion and the Unicorn. The Crab seek jade as the corrupted armies of the Shadowlands press against the Kaiu Wall with uncanny strength. And, in the shadows, the Scorpion nudge these conflicts further along—one whisper at a time—looking to increase their standing with the Emperor and within the Imperial Court. At the center of it all stands the walled city of Toshi Ranbo—looming over the fertile fields of the Osari Plains. Inside the city, a contingent of Crane soldiers frustrates the Lion who claim the military stronghold as their ancestral right—and who seek its reclamation as a matter of vengeance, having lost their Clan Champion outside its gates. And while the Crane see the city and the crops it represents as instrumental to their survival in a time of famine, several of the other clans have their own interest in Toshi Ranbo. The Crab have heard rumors of the mines of jade that lie near the city. The Phoenix grow increasingly concerned that restless spirits wander the fields outside the city's walls. And the mysterious Dragon appear to have signaled their own interest in the city by descending from the mountaintops—although their true motives remain as inscrutable as ever. 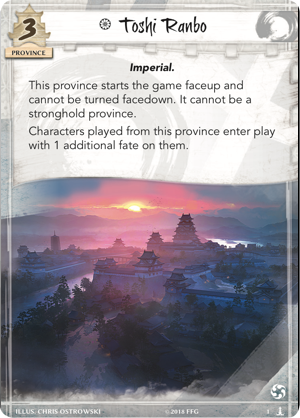 For over half a year, these tensions have continued to rise and mark the conflicts of Legend of the Five Rings: The Card Game. They have spilled into the courts and the battlefields, and all seven of the Great Clans have sent their samurai to represent their interests. Throughout the Kotei Series events of the Toshi Ranbo Season, thousands of bushi and courtiers have fought with blades and clever words—seeking Favor Points, Elemental Points, and Glory Points to strengthen their clans' positions within the Imperial Court and throughout the lands of Rokugan. Who Will Claim Toshi Ranbo? Soon, the conflicts of the Toshi Ranbo Season will come to a close. There is only one Kotei Series event remaining—the Grand Kotei at Gen Con Indy 2018. And it will see the Great Clans once again competing for the final Favor Points, Elemental Points, and Glory Points. So as the Great Clans send their strongest samurai to compete, who will claim the Emperor's favor and host his Winter Court? What new elemental roles will the shugenja at this event secure for their clans? Who will claim Toshi Ranbo? Throughout the Toshi Ranbo Season, the clans' greatest samurai—their Hatamotos—have sought to win the Emperor's favor. Each year, the Emperor extends the honor of hosting his Winter Court to the clan he favors most. But only the victories and defeats involving the greatest of warriors make their way from the Kotei to the Emperor's ears. Accordingly, the Hatamotos from each of the Great Clans have won or lost favor for their clans throughout the Toshi Ranbo Season, winning their clan ten Favor Points for each of their victories and losing ten Favor Points with each of their defeats. 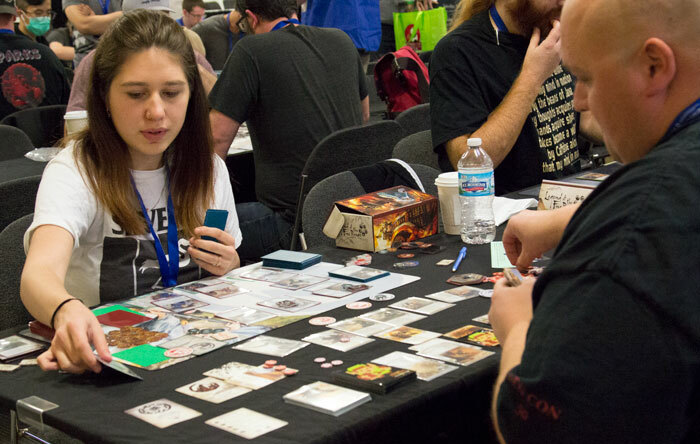 There's much yet to be determined, since the points won or lost at each Grand Kotei event—such as Gen Con—are doubled. Nonetheless, as we near the conclusion of the Kotei Series, a picture has begun to emerge. For all their hard work at the Kaiu Wall, the Crab have gained a great measure of influence within the Imperial Court. Yet the Scorpion have spent the better part of the year insinuating themselves deep into the Imperial Court, and they have gained a great share of the Emperor's favor. One of the most interesting twists coming out of the Toshi Ranbo Season is that—as we recently announced in the article "Something Is Coming"—the extra elemental role each of the Great Clans has been pursuing won't just be available for a short time and a single event, but for several months and for all levels of Legend of the Five Rings: The Card Game Organized Play. This is a major development and is bound to lead to all kinds of experimental new deck designs. But what roles are each of the clans likely to win? Again, the season has not yet concluded, and the Grand Kotei at Gen Con Indy leaves much to be determined, but as things stand after all the other Kotei Series events, we find the Unicorn poised to claim their favored elemental role thanks to the fact that the draft order starts with the clan with the fewest Elemental Points. After the Unicorn, we find the Lion and Dragon positioned to draft the elemental roles they currently favor while the Scorpion are likely to find themselves drafting their third choice for extra elemental role, as the Crab and Crane currently stand to draft the Scorpion's first and second choices, barring any changes in the standing of Elemental Points or the clans' preferences for elemental roles. Once again, it's important to remember that these roles may still change. Much depends upon the results of the Grand Kotei at Gen Con Indy, and we will post the new elemental roles for each of the Great Clans in an official update shortly after the event's conclusion. The third and final dimension to the conflicts of the Toshi Ranbo Season is the accumulation of Glory Points. 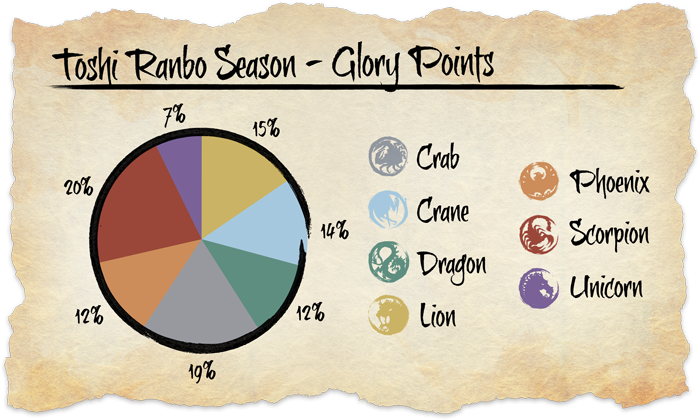 These are arguably the most important points that the Great Clans can win throughout the Toshi Ranbo Season, for they determine which clan will seize control of the city. Thirty of these points are awarded to each player who advances to the Top 16 during the Daimyō Stage, with another one-hundred points awarded to the Champion. Additionally, two-hundred Glory Points are awarded to the clan that wins the most honorable title at the Magistrate Stage, with each other clan in honorable rank order earning twenty fewer points than the clan ahead of it. 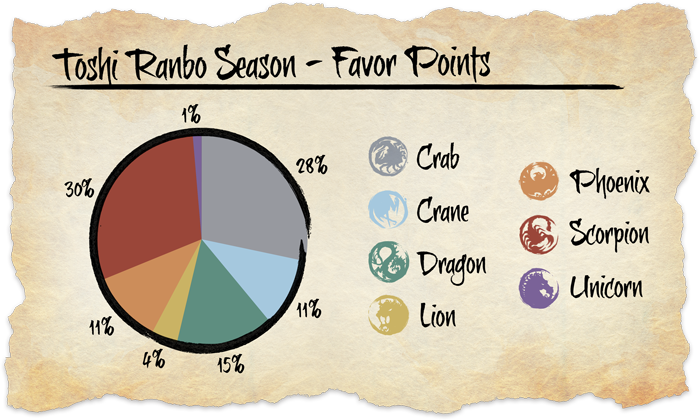 This means that the Grand Kotei at Gen Con Indy could see a swing of more than 600 points, but even in that unlikely event, the Crab and other clans will be hard-pressed to steal Toshi Ranbo away from the Scorpion who have slowly and subtly insinuated themselves throughout the Toshi Ranbo Season. As you can see, the Scorpion undercut their rivals frequently enough that they enter the final Kotei Series event as strong favorites to claim the military stronghold… in the name of the Emperor, of course. For their efforts, the Scorpion will find Toshi Ranbo a most unusual stronghold. Like Before the Throne (The Chrysanthemum Throne, 61), the city cannot be a stronghold province. Also, it starts the game faceup and cannot be turned facedown. This means that it will present itself as a target from the game's very first turn—and, at three strength, one that might easily be broken. Accordingly, Toshi Ranbo would seem a strange target for the Scorpion, who value their secrecy and have been known to pursue victory even at the risk of dishonor. But the city will still prove its worth since every character played out of its gates will enter the game with an additional fate. This will prove of only minor importance on such characters as the Bayushi Manipulator (Core Set, 96) and might even delay the Bayushi Liar's (Core Set, 95) expected departure, but it could lend the clan a massive boost when that extra fate lands on one of its most powerful characters—such as Bayushi Shoju (Core Set, 107) or Soshi Shiori (The Fires Within, 49). One can almost imagine the smiles the Scorpion are sharing amongst themselves, safely hidden within the shadows and the walls of their homes. But the Toshi Ranbo Season has not yet ended! Can the Crab smash their way past the Scorpion? The Lion and the Crane, who have long contested the city, now find themselves at risk of seeing the Emperor strip them both of the city. Will either of these clans find some way to surge to the front—or to tilt the balance in favor of either the Crab or the Scorpion? Again, we won't know the true shape of the city's fate until after the Grand Kotei at Gen Con Indy comes to a close. Then we'll be sure to share the results! If you're headed to Gen Con Indy, we look forward to seeing you at the Grand Kotei. If not, then be sure to check our website shortly after the event. 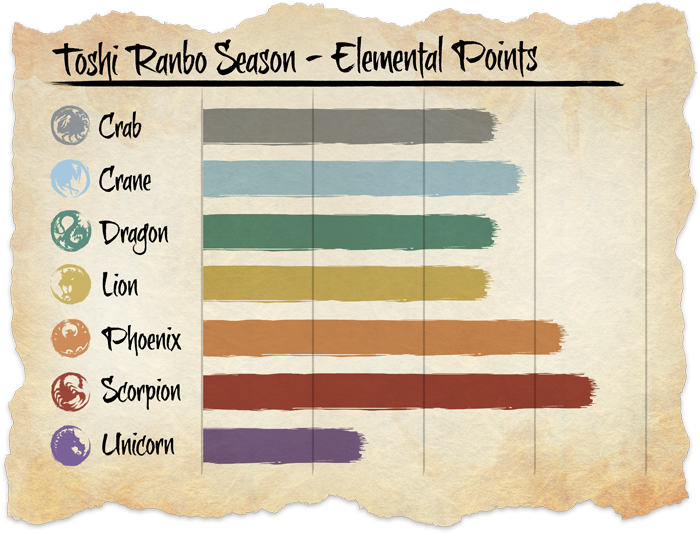 We'll post the official results of the Toshi Ranbo Season, so that you'll know which clan will host the Winter Court, which elemental roles each clan will gain, and which clan will take control of Toshi Ranbo. 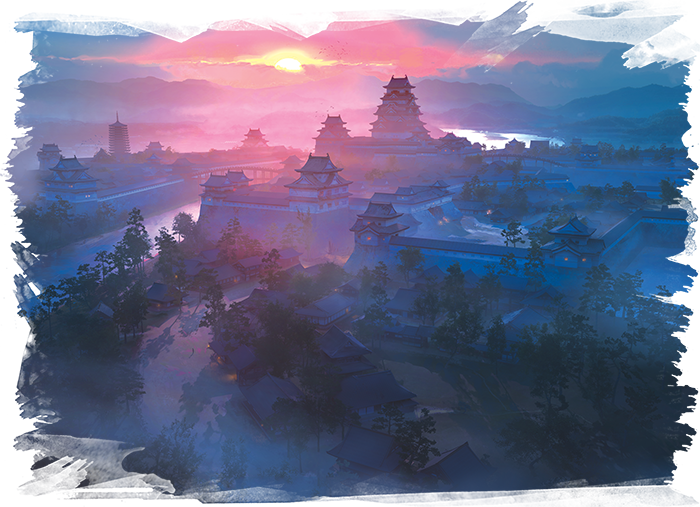 Then be sure to keep checking back for more information about Legend of the Five Rings: The Card Game and its Organized Play, including a look at the stakes of the upcoming 2019 Kotei Series!